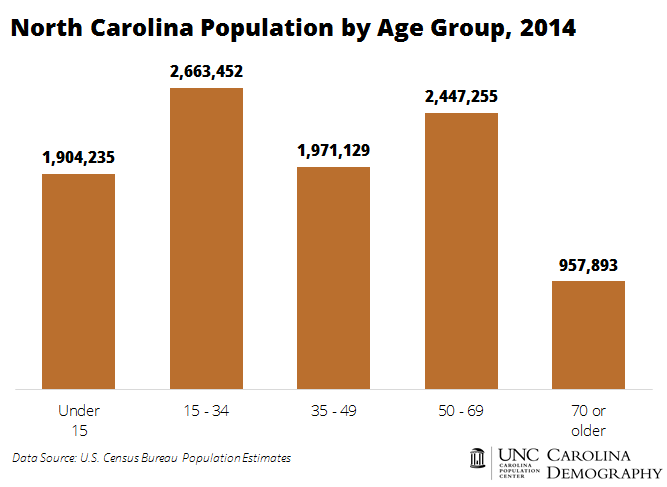 The U.S. Census Bureau’s detailed population estimates for 2014 show similar patterns in North Carolina. Individuals age 15-34 are the largest age group in the state: 2.7 million individuals or 27% of the state’s total population were between the ages of 15 and 34 in 2014. The Baby Boomers were the second largest age group in 2014, with 2.4 million or 24% of the state’s total population in 2014. In 2014, nearly two-thirds (64%) of the state’s population was non-Hispanic white, 21% was black, 9% Hispanic, 3% Asian or Native Hawaiian/Pacific Islander, 1% American Indian, and 2% of two or more races. In North Carolina, as in the nation, diversity is greatest among the youngest age groups. Among individuals under 15, nearly 1 in 2 (47%) were part of a minority race or ethnic group in 2014. Individuals of two or more races have the highest proportion in the under 15 population (4%), reflecting increasing rates of interracial marriage and childbearing as the overall population diversifies. This entry was posted in Carolina Demographics and tagged age, Baby Boomers, diversity, millennials, population estimates, race/ethnicity, U.S. Census Bureau. Bookmark the permalink.